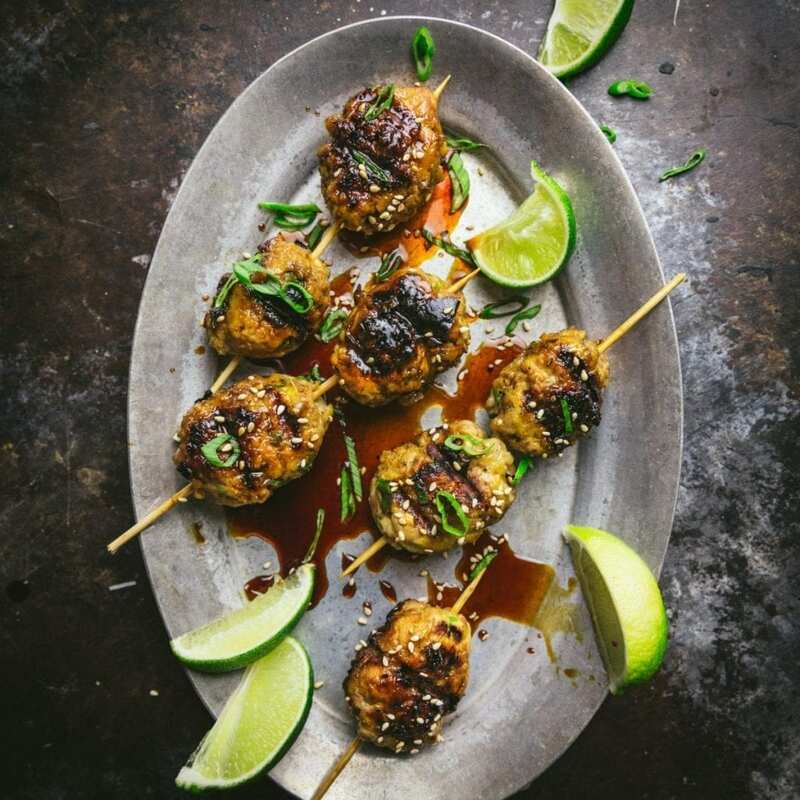 These Japanese-style chicken meatball skewers, called Tsukune, are grilled to a deep golden brown and brushed with a sweet soy glaze. Great for game day snacks or just when you feel like eating something on a stick (which is every day for us). Well, it’s finally that time of year. You know, when we can all go outside, hang out on the deck with friends, throw stuff on the grill, enjoy the warm summer’s evening because OF COURSE NOT, IT’S JANUARY, WE JUST GOT DONE WITH -10F TEMPS, ARE YOU CRAZY. And yet this weekend my inbox included an email from our favorite national home-improvement chain inviting me to shop all their grill options. Thank you, Home Depot, I’ll wait until I can defrost the patio furniture before I start thinking about firing up the grill. But who are we to tell you when you can and can’t eat something? If you want to make a strawberry Pavlova in November, or roast a butternut squash in March, you do that, friend, and go with our blessing. If you feel like grilling meatballs on a stick in January, whether you brave the cold to man the grill, or use a grill pan on your stovetop, or forgo the grill entirely and opt for the broiler, is there any good reason you shouldn’t? There isn’t. There’s no good reason at all. 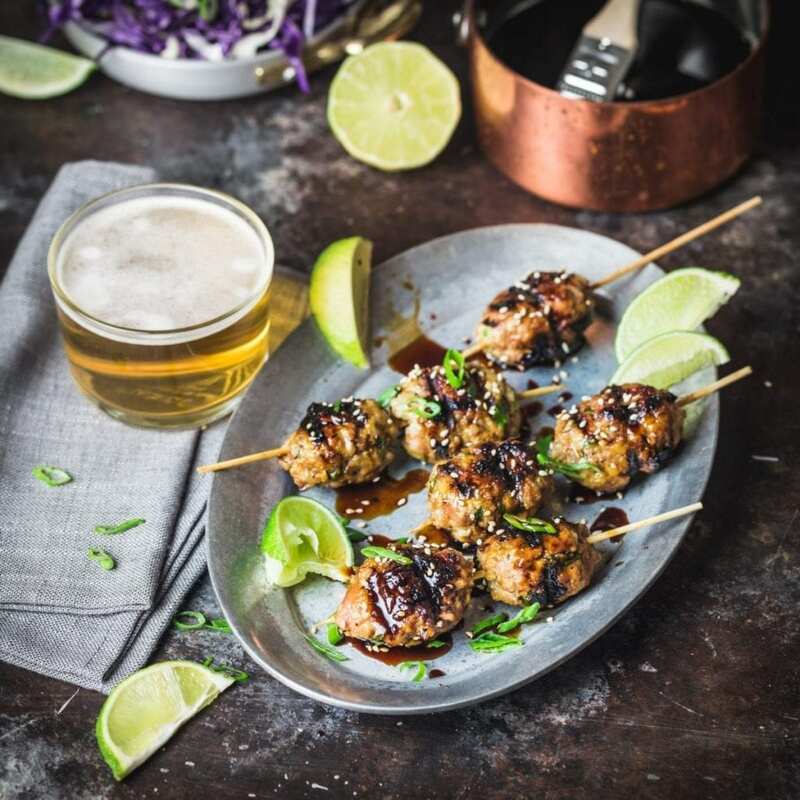 Brush on the sweet soy glaze, a squeeze of (non-traditional) lime and enjoy with an ice cold beer. There’s an atavistic glee to be had from making food-on-a-stick. The Schöningen spears tell us that mankind was sticking sharp things into their foodstuffs as far back as 400,000BC, and our species was certainly making fire around the same time. It stands to reason that someone discovered the convenience of grilling a speared hunk of meat somewhere around that period. 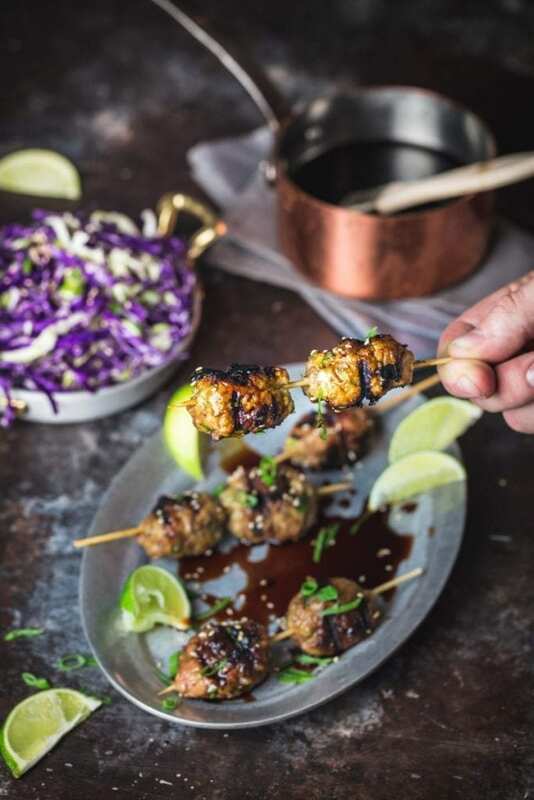 Here on the blog, we’ve posted recipes for a summery skewered chicken, tomato and basil as well as a more season-agnostic Asian-style chicken with avocado-cilantro sauce. Japan’s izakaya cuisine is part of that tradition: casual, pubby, tending to small plates shared tapas-style. 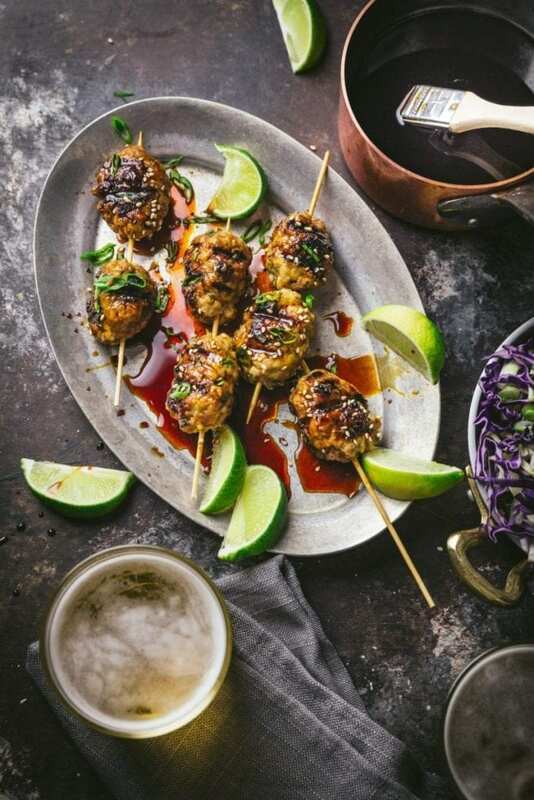 It includes yakitori – skewer-grilled chicken – and specifically, tsukune, a chicken meatball grilled and brushed with / dipped in a tare (sweet soy) sauce. We adapted Joshua Bousel’s tsukune recipe from Serious Eats and, because we find ground dark chicken meat difficult to find (and didn’t want to use the leaner, drier white meat) we substituted ground dark meat turkey. You could certainly use white meat, just be careful not to overcook them. Keep in mind that the balls are much easier to work with if the meat is cold, so if they warm up a bit as you’re forming the balls, you can chill them a little once they’re rolled and on the sticks – that way they’ll be easier to get on the grill without falling apart. We also form them into oblong, mini-meatball shapes rather than fully round balls which gives them a little more surface area for the grill. Make sure the grill or grill pan is good and hot, brush it with oil, and let that also get up to temp before laying the skewers across it. Each side will take just a few minutes to properly brown – don’t be tempted to move it around too much or it’ll never get those beautiful griddle lines. You can also lay the balls on an oiled, foil-lined sheet pan and broil them until they turn brown, brushing them with the glaze every few minutes. This would be an easy way to get a lot of them done at once, if you’re making a big batch for a party. Along with the tare (sweet soy glaze) for drizzling and dipping, we liked the brightness and acidity of some lime wedges squeezed over. It’s not traditional, but very delicious. We also turned ours into a full meal so we served it with steamed rice, our favorite miso red cabbage salad, and a few ice cold Japanese lagers. Combine soy sauce, mirin, sherry, brown sugar, vinegar, garlic, ginger slices, and peppercorns in a medium saucepan. Bring to a boil over high heat, then reduce to a gentle simmer. Cook until mixture is thick and syrupy, about 25 minutes. Let cool for 10 minutes, then pour through a fine mesh strainer. Set aside or store in an airtight container until ready to use. In a large mixing bowl add meat, panko, corn starch, scallions, egg, ginger, garlic, sesame oil, salt, and pepper. Using your hands, mix until thoroughly combined. Cover bowl with plastic wrap and refrigerate for at least 15 minutes, up to overnight. Using wet hands, form mixture into 1½-inch long slightly oval meatballs (like tiny meatloaves). Thread 2 to 3 meatballs onto each skewer (if grilling). If broiling, place balls on a lightly greased foil-lined baking sheet). Prepare a grill or stovetop grill pan for high-heat. When hot, oil grill well and place skewers a few inches apart. Cook until first side is well browned and meat releases easily from the grill, about 3-4 minutes. Using tongs and a thin spatula, gently rotate meatballs and cook until well browned on second side, 3 minutes. Brush sauce generously over meatballs and allow to cook for 15-30 seconds longer, until brown and charred in spots. Transfer skewers to a plate and brush with sauce again until meatballs are well-glazed. Preheat broiler and set rack 5 inches from heat source. Place the meatballs on a lightly greased foil-lined baking sheet and broil the meatballs, turning and basting every 2 minutes with the glaze, until the meatballs are cooked through and dark golden brown, about 8 to 10 minutes. Transfer to a platter. 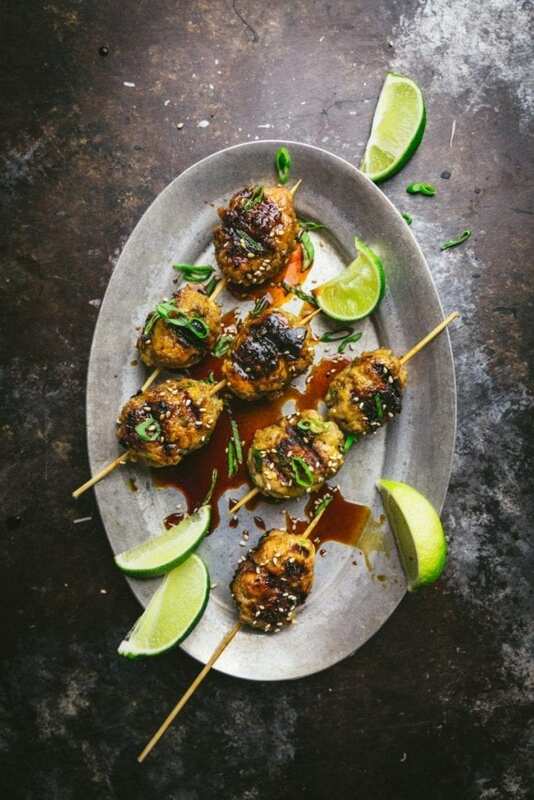 Sprinkle meatballs with scallion greens and toasted sesame seeds and serve while hot. I could not imagine living with such cold weather, living in the outer suburbs of Sydney our lowest winter day time temperature would be 12 c (53 f) . We are now the opposite to you and are in summer, we have had days over 45 c (104 f) so the BBQ is not an option on those days as I am not moving out of my air conditioned home but these will be perfect for days when it is a little cooler. Looking forward to make these. Wow Carol, that’s HOT. I would definitely not be grilling either. Or heating up the stove at all :). Enjoy the nice weather while you have it, though!